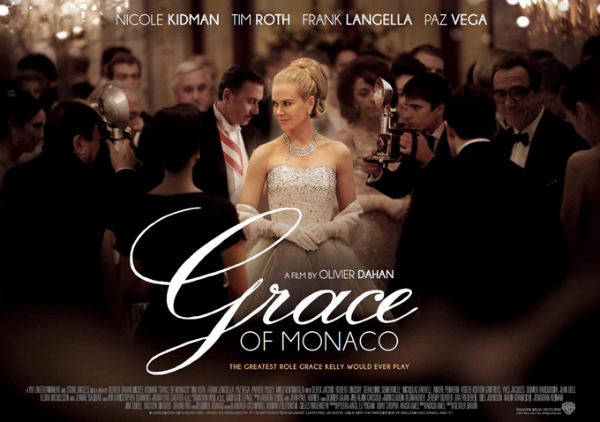 Nicole Kidman pouts and frowns away as former Hollywood star Grace Kelly. Not as bad as you think but certainly not that good either. A film that questions its own relevance as its draws nearer to its pretentious finale. We join Kelly as she deals with the crisis of marriage and identity during a political dispute between Monaco’s Prince Rainier III and France’s Charles De Gaulle in the early 60s. With the threat of a looming French invasion, Kelly must deliver her best performance yet. The premise really sounds a lot more interesting than this film actually is. I mean it zips along well enough to keep you watching. But it seems ridiculously exaggerated to keep you entertained and less dramatic than it should be. I know there was a little controversy around the film’s release. However, it is done in such a light, fluffy style that you feel like you are watching one of those films on the True Movies channel. Kidman does her best but the material is corny, clichéd, predictable and all a little nothingy. I was a little anxious on how Tim Roth would convey the Prince after his random twitching and creepy face pulling from the cancelled TV show Lie to Me. However, he was very good and played a much more revered role. To be honest, there is a great supporting cast and they do their best to bring this bumbling biopic to life. Parker Posey (Superman Returns) plays the sour faced cow of a personal assistant to perfection. The eloquent speaker that is Frank Langella (Robot and Frank – He will always be Archer, Leader of the Gorgonites) providing his supporting gravitas yet again, even if I couldn’t determine what position in the papacy he actually had. It was great to see Robert Lindsay (My Family) given the platform, even if his accent was a little wishy washy. However, there were a few duds. Roger Ashton-Griffiths (The Cook, The Thief, His Wife and Her Lover) certainly looked like Alfred Hitchcock but his manner was all wrong and incredibly droll. Terrible. Milo Ventimiglia (Heroes) was a very weak and passive character. Anyone could have played him. It’s beautifully shot. Kidman does her best. The fact that Kelly’s career was used against the Prince which put her in a state of isolation was an interesting angle that did deliver some watchable moments. However, addressing the people and learning to act like a Princess came off very hammy. The training montage in which Kidman is pulling faces to convey emotions in a certain way was hilarious. It felt like a parody of The King’s Speech with Derek Jacobi (Gladiator) being a flamboyant Geoffrey Rush. The whole crusade in which Kelly must choose between her acting career and family did make engaging if predictable viewing. However, the film gets a whole lot sillier and Kidman’s Kelly soon becomes a martyred Diana. And that’s kind of the problem. The pressures of being a Princess and having a family is a good topic but it was always done so cheesily and predictably that it doesn’t amount to much. Kelly’s closing speech was merely an elongated collection of words with some operatic music for dramatic effect. It made no sense. Kidman might as well have said this is the part where I say something that will inspire the people and help the nation. That naff, I’m afraid. This film very much follows the vein of Diana. Corny, predictable, the cast do their best but for all its efforts, you can’t help but feel what the point was in the first place. 2.5/5 for me. Currently ranks #144 out of 182!